This is plate 5 from 'Sketches in Afghaunistan' by James Atkinson. Atkinson was the official Superintending Surgeon of the Army of the Indus, a combined force of British and Indian troops, that marched on Kabul in 1839. The troops entered Afghanistan through the Bolan Pass in the south. The shortest route would have been through the more difficult Khyber Pass, but to get to the Khyber they would have to cross Sikh territory and Maharaja Ranjit Singh was loathe to let them do it. The Bolan Pass is 60 miles long and some 5880-feet tall at its highest point. It took the army two weeks to emerge from it. Atkinson wrote: "As the torrent in the Pass runs deviously from one side of the gorge to the other, the Army was compelled to cross it six or seven times, thereby adding to the hardships already experienced during the march into this Pass." 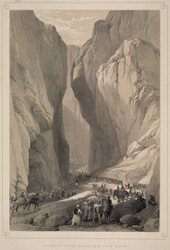 The troops suffered great losses from hostile Baluchis, "who had secreted themselves in dens hewn out of the stupendous mountains overhanging the Pass".